Storm Brian was the second UK named storm of the 2017 season, following hot on the heels of Storm Ophelia the weekend before. It brought big winds, rain and huge swell to areas of the UK on 21st October. The day after, we began getting reports of baby octopuses in rockpools in South West England – an extremely unusual occurrence - and then from Wales and farther afield..
We are now collecting any sightings of octopus in England, Wales and Ireland from 21st to 24th October. We are trying to map all the sightings to help us understand where the strandings were taking place - so far it looks like we have a cluster around Anglesey and one in North Devon. If you have seen one, please email hello@beachstuff.uk or post details to our facebook group. We'll then pop it on the map. Thanks to everyone who has let us use their photos. They are great to see! 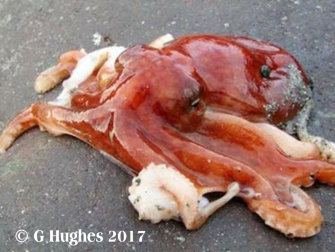 Thanks to Gordon Hughes for the shot of this fine adult curled octopus sighted at Trefor beach. For more information about octopus in British waters, please visit our page on them. Let your cursor hover over the circles to see the details of each sighting. 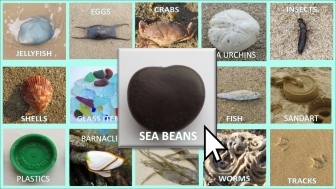 If you click on a circle, a photo (or silhouette if we have no photo) will appear on the right. Click to visit our galleries of finds.